The most frequently climbed mountain in the Tour de France is the Col du Tourmalet in the Pyrenees, just south of Lourdes, France. It is the highest paved pass in the French Pyrenees, and on a normal day it is one of the prettiest mountains I've ever seen. Here's what it looks like when the weather is good. 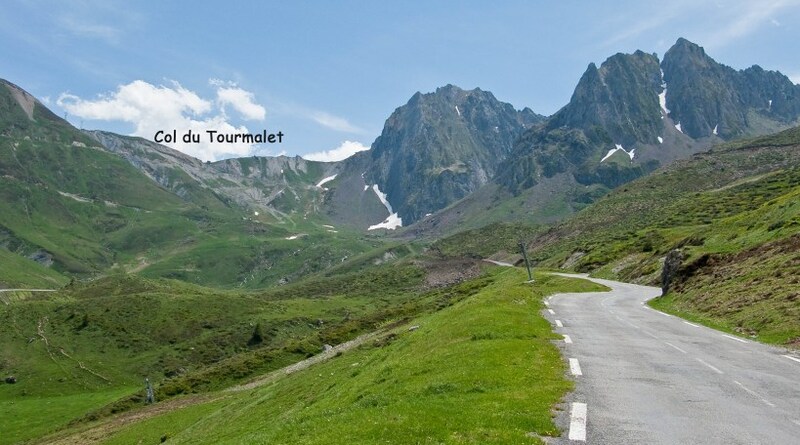 This is a 12 mile climb with more than 5,000 of vertical feet of climbing - the summit is at the notch just below the "T" in Tourmalet. Today, however, it was not too bad at the base, but as we ascended the temperature dropped and it started to mist. And then, as we approached the summit, it started to rain. When you're climbing a bike in the rain you don't really notice the temperature, but when you stop at the summit (at 7,000 feet) and it's 46 DEGREES you notice it quickly! Here's a picture of Val and me at the summit trying to stay warm. The descent was a little sketchy shivering on wet roads with low visibility, but we all made it down safely without incident. When we arrived at the town at the base of the mountain we were all shivering so we went into a cafeteria to order coffee. When the hostess saw us she asked if we wanted tall glasses of hot water to warm our cold hands - the coffee and water were much needed! 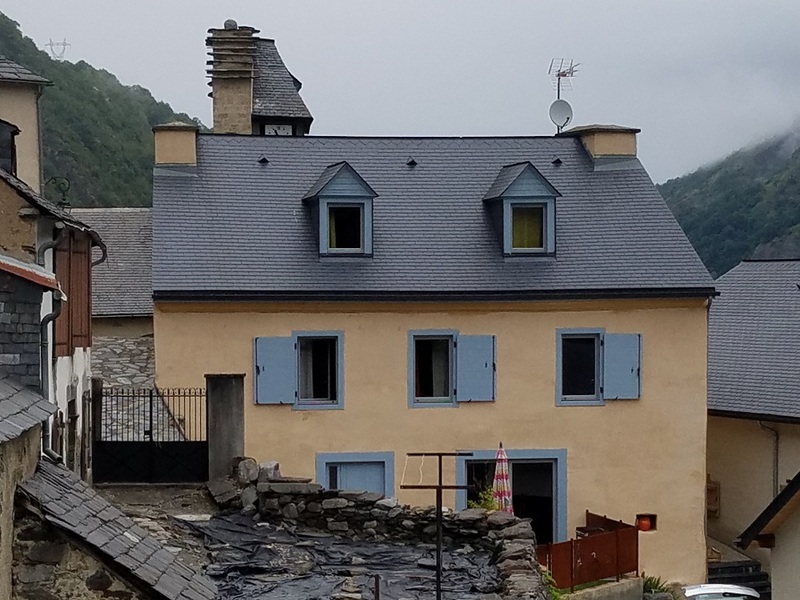 Here's a picture of our rental house, with the top pf the church tower behind it. This really is a cute village - probably 20 buildings total, including a fabulous restaurant where we ate dinner tonight. 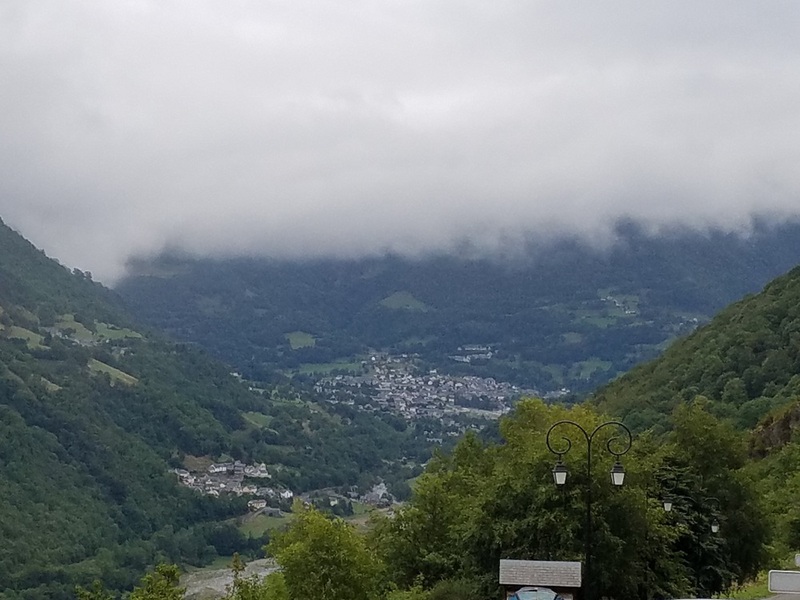 And here's the view down from our village towards the town at the base of the Col du Tourmalet . . . notice the thick cloud cover.